The Wait, What? Roundtable: Justice League #34 and Batman #36 - Wait, What? It’s a truism of writing about comics on the internet that first issues get a lot of attention and hyped issues get a lot of attention but no one ever bothers to talk about anything from issue #3 onward. With that in mind, Graeme and Matt decided to get together to do a good-old-fashioned Roundtable on Justice League #34 and Batman #36. Enjoy! MATT: I cannot help but approach this Justice League title feeling happy for Priest. One of his most common refrains in anecdotes and essays and what-not, is that he (understandably) hated the fact that in the later years of his career he only ever got calls to write black superheroes. There are two instant “yes”-es in my vocabulary: Batman and Iron Man. Yes. Without question. That’s the smallest piece of fanboy remaining in me. But that’s had 30 years to happen and it hasn’t thus far. I am terribly concerned about being so closely identified with black characters. It’s not that I don’t like Sam, but I want to write Tony Stark. I want to write Clark Kent. I want to be a guy, a real guy, a regular guy without any pronouns or adjectives. Blank Guy. Blank Writer. So as a long time reader (and fan and sometimes critic) of Priest’s work, it feels like a big deal that he’s got the helm on what is currently the flagship Justice League book, just as the movie comes out. Before getting into any actual reactions – Graeme, are you coming to this from a similar place, or am I the only one lugging this much (of someone else’s) baggage around? GRAEME: No, I’m pretty much in the same place as you – happily surprised that Priest (and Pete Woods, for that matter, who’s been an artist whose work I’ve enjoyed for at least a decade now, if not longer) got the gig, although I’m also a little cynical/nervous about it. Part of me wonders if their job is essentially a placeholder to keep the book chugging along nicely while Geoff Johns and Gary Frank use the characters in Doomsday Clock, with part of that being an expectation that they’ll handle the book very professionally, but not rock the boat in any particular manner. Priest’s statements when he was announced on the title, saying that he planned to treat the book “more like a workplace drama” fit that mold for me, because there’s something implicit in that description for me about the status staying quo, and things being… well, almost humdrum. This isn’t a complaint; I love the 1970s Justice League of America, which pretty much had that approach, and I think there’s a lot to be said for embracing a Justice League title where you can’t change much beyond solving that month’s particular problem. All of which made my expectations surrounding this first issue particularly complicated: I wanted to love it, but I was also worried that it would be intentionally smaller in scope. MATT: I found the scope to be one of the fascinating things about this debut issue. At least since Grant Morrison’s run, it feels like the traditional way to kick off your take on the Justice League is to go as widescreen huge as possible – remember when Mark Waid and Bryan Hitch used a literally oversized one-shot to start their run? – and Priest…doesn’t exactly do that. On the other hand, he doesn’t exactly not do that, either. Instead, he turns another modern Justice League trope on his head and takes a look at how Batman can possibly be hyper-competent enough to keep up with gods and aliens all the time, with the answer being – in characteristic Priest fashion – that he quite obviously can’t. So you’ve got the traditional world-shaking crises, and the associated widescreen action, but that’s not the actual driving conflict of the issue. The result is something that really worked for me, Priest being Priest without letting his sometimes-needlessly-baroque impulses obscure a clear, entertaining Justice League story. 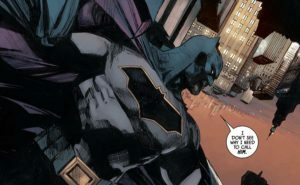 GRAEME: More than anything, this issue reminded me of the first issue of the Joe Kelly/Doug Mahnke run – it has the same everyday approach to the fantastic, the same take on “Yes, they do the impossible so often that it’s become second nature, but that doesn’t make it easy,” and also, perhaps surprisingly, the same slightly-snarky character interactions. Throughout the entire issue, I couldn’t shake the Deja Vu. This isn’t an insult; “Two-Minute Warning” – I just looked it up, it’s from 2002’s JLA #61 – is a great story, and it’s the start of one of my favorite Justice League runs, so if anything recapturing that feel is a sign that I’m going to really dig this run, too, however long it may last. But it was nonetheless surprising to have such a feeling of familiarity so early on. The conceit of the Batman issue is that Bruce hasn’t actually directly told Superman about his engagement to Catwoman, and as a result, Clark’s feelings are hurt. Lois tries to counsel Clark and Selina tries to counsel Bruce and meanwhile there’s a villainous McGuffin going on just so this can be a proper superhero book. So this is, in other words, basically a Judd Apatow-ish romantic dramedy only starring Batman and Superman. And much to my surprise, it mostly worked for me, and I’m excited to see where it goes in the next issue. Is this because the Morrison-influenced “he’s the most dangerous man on Earth” Batman has actually run its course, or just because as I’ve plodded further into normcore middle-aged dadhood I (and the other doughy folks like me) want to see a more human Batman? GRAEME: I think it’s both. Jeff’s on record as thinking that King’s unpicking of the Batman mystique is very much not his bag, but I think it’s long overdue – between Morrison’s JLA and his subsequent Batman run, we had the Invincible Batman for more than a decade, it was more than time for a change. 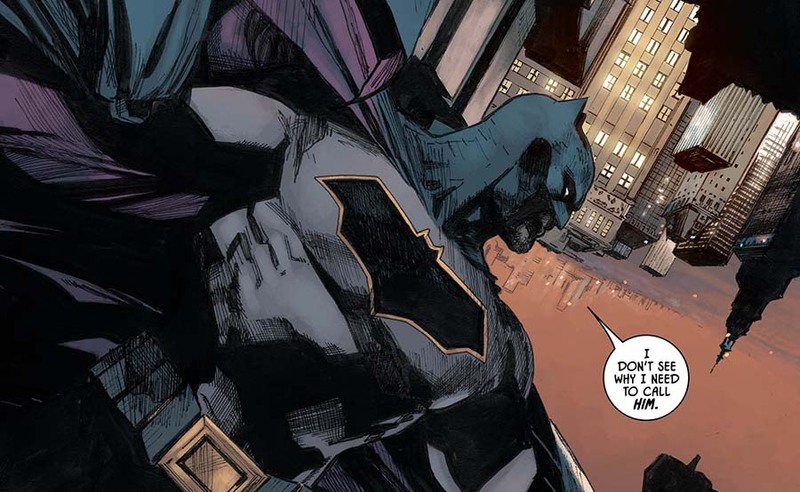 Even as I write that, though, I think that Scott Snyder’s Batman was the genesis of King’s take in many ways – a Batman who was fallible, if not as flawed as King’s. It’s the fact that King’s Bruce Wayne is not only flawed, but that he and everyone around him, is aware of it and comments on it, that makes him (and the current Batman series) so interesting to me. Formalism of this issue aside, I really appreciated the duality of both Bruce Wayne and Clark Kent stubbornly pretending that their feelings aren’t hurt, with Selina and Lois supporting them while knowing better. The interplay between the characters before they even meet (and especially after they meet) was fun, and humanizing, far moreso than the duelling narration device of Loeb’s. You can just imagine how he did it, can’t you? “I’m not upset –” “He’s not upset –” “– but I thought that our FRIENDSHIP was worth a HEAD’S UP on Bruce’s ENGAGEMENT.” “–but I should have TOLD him about my ENGAGEMENT because he’s my FRIEND.” All against a split-page splash of Superman flying into space with his mouth open wide and Batman swinging off a roof. 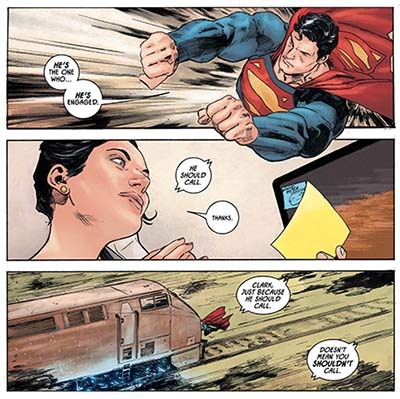 I mean, I’m a sucker for well-written soap operatics like this, and I’m a sucker for Superman and Lois, so this issue was pretty much catnip to me. Like you said, everyone felt like a recognizable adult. That is actually another link to Priest on Justice League, for me: The idea that there are people doing their jobs and getting on with each other. Could this be a new trend for DC’s superbooks, at least? MATT: Your Jeph Loeb imitation is frankly unsettling. As far as circling back to Priest’s debut on Justice League, I guess my question is this: What do we expect and/or need from his run? Are solid-superheroic, Kelly-run-esque stories enough? Or does it need to be more. GRAEME: Look, I’m perfectly satisfied with solid-superheroic, Kelly-run-esque stories. That will work just fine for me, and I admit to wondering what kind of “more” you’re asking about. More than that, I find myself internally recoiling at some possibilities: I don’t want this to be at the center of some massive crossover, nor do I really want Priest or Woods to self-consciously try to make a grand statement about superheroes. The more I think about it, the more I realize that all I really do want from this run are good superhero stories. 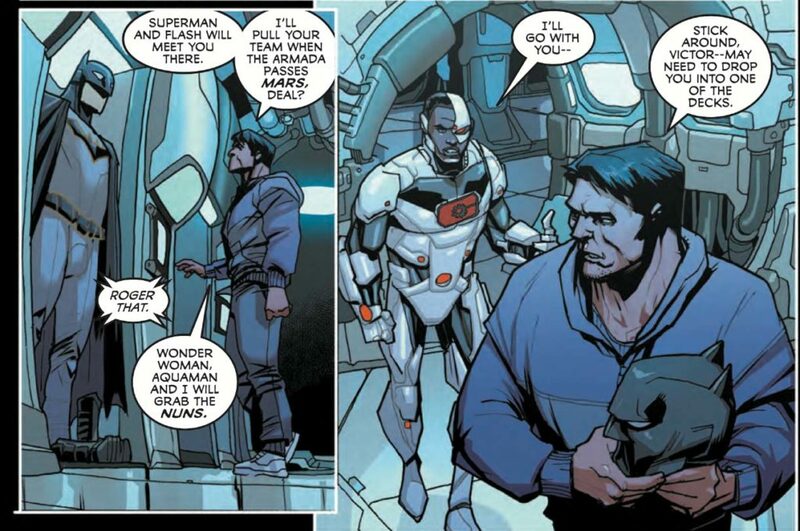 That’s all I want from a Justice League comic in general, to be honest. Am I being lazy or a bad fan in admitting that? I guess the only “more” I was referring to was … I dunno, in Priest’s best work (for me that would be Black Panther, early Quantum & Woody, and my beloved, much-missed Xerø) he brings some kind of distinct, particular point of view to the proceedings. You make it three pages into any of those and you know (for better or for worse) that you’re reading a Priest book. GRAEME: They met their kids! And there was something about the Infinity Incorporation or something involved! And time travel and at least two variations on Starro! I think, based on this first issue, there’s little chance that this will be mistaken for the Hitch run: there’s an energy here in both visuals – really, I can’t say that Woods makes the book look amazing here enough, so I’m saying it for the second time – and in the writing (the dialogue has a snap to it that Hitch never managed) that it feels very much like a different book to me. And a far better one, too. Between this and Batman, DC’s having a strong week for superhero books as far as I’m concerned. 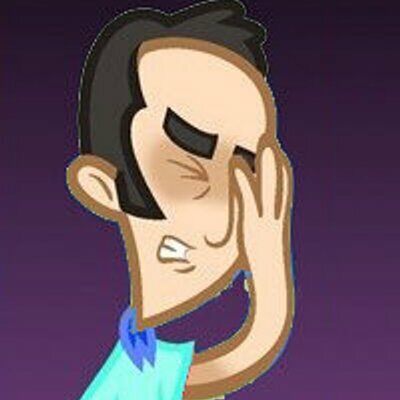 MATT: Nope, definitely don’t recall any of that Hitch stuff! I agree with everything else you’re saying here (especially Woods’ art, which I’ve totally failed to mention). I mean, I’ll definitely keep reading Priest’s Justice League, and it sounds like you will as well – I just hope enough people agree with us to make it so overwhelmingly successful that DC has no choice but to bring Xerø back into print. I don’t think that’s too much to ask. In all honesty I wonder if this should be the proper byline for the DC Rebirth initiative, or at the very least the current editorial policy for DC. Let’s make the comics competent superhero stories, and save all the special stuff for… well, the specials. and I think it’s this that Marvel failed to realise when looking at Rebirth’s success, and they still think that everything needs to be an “everything you thought you knew is wrong” reading experience. I’m still on the fence about King’s Batman. On one level, repurposing the title into a romance comic should very much be my cup of tea, but I’ve found far too much of it so far drawn out and overly laboured. This approach works on Mr Miracle precisely because of it’s length, but in all honesty the actual amount of material that has filled 36 issues could very easily have fitted into half that length. I fin it interesting that the main comparison for King is Moore, as for me the writer he reminds me most of is Brian Bendis: they both arrived on the comics scenes with very recognisable voices, but haven’t really developed them since, and I worry that I’ll rapidly tire o King’s mannerisms and tics in precisely the same way I have with Bendis. I think you’ve called it on Rebirth. 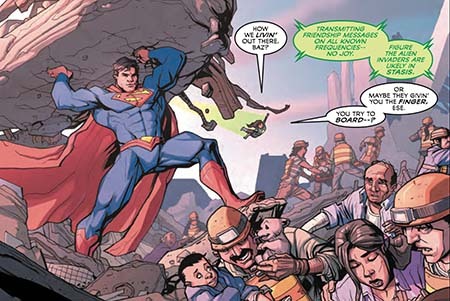 DC’s real success with the relaunch was getting the characters back to the forefront of their own superhero stories, giving room for big events to actually feel like big events again. You can almost see King finding his footing on the Batman book over the first arc. It really only clicked into place for me what kind of writer he’d be on Batman in the last part of the first arc, in that scene with Alfred in the Batmobile, and the next arc flowed a lot smoother for me because of it. But like with a lot of the Rebirth books, it was those first arcs feeling relatively light on “big reveals” that actually made the titles feel impactful again when they got to the bigger stuff each writer wanted to or needed to do. Green Arrow’s another really good example of this. I haven’t read the JLA issue yet, but I did read Batman #36, and it made me so happy. It reminded me in tone of a bunch of Levitz’s run of Legion of Super-Heroes, where the characters had time to grow up and deal with adult life, from the tragic to the hilarious. I don’t have anything against teen and very-young-adult protagonists as such, but they usually don’t interest me a lot these days; I really, really like seeing more grown-up characters and the ways their lives go. You know, there are times when I’ve wanted to call you out, Graeme, for having your identity being way too invested in being a DC fan, and I’ve held my tongue, but not this time. You are not being a bad fan for wanting that. AT. ALL. Anyone who makes you think that should have their head examined. I rise in support of my honorable colleague’s remarks.